What was the meaning of liberty in 1776? In 1776, colonists in North America declared independence from Britain. But, both before and after the Declaration, independence for the United States was not a given. Amid growing dissatisfaction with British rule, members of colonial society had to decide what their future would be, how they would relate to Britain, and how much blood they would be willing to shed for their demands. Different people had different stakes and interests—freedom did not always mean the same thing to colonial patriots, loyalist Tories, enslaved Africans, or native people facing complex questions about their rights, their identities, and their futures. The American Revolution: Experiences of Rebellion draws students into the promise and uncertainty of this era. Considering the perspectives of various stakeholders—European colonists, enslaved Africans, and native peoples—students explore the factors that led to rebellion, war, and, ultimately, the independence of the United States. Part I of the reading reviews the colonization of British North America and the roles of colonists, enslaved people, and native groups. Part II examines the sources of tension between colonists and the British government as well as the increasing push for political representation. Part III explores how ideas of independence erupted into war and what the Revolutionary War did, and did not, accomplish for different groups of people. Students interpret an eighteenth century Catawba map and consider the complexities of relations between native people and colonists. Taking on the roles of a range of people present at the time of the American Revolution, students gain familiarity with the ideas and values of individual actors in a broader historical context. Students analyze a print's portrayal of colonial rebellion to consider how art can provide insight into different historical perspectives. Working collaboratively, students take on the roles of people in British North America and explore three different options for the colonies' future in a role-play activity set in 1776. Using primary sources from various moments in U.S. history, students examine how the principles of the Declaration of Independence have been interpreted and invoked. For use with the "Art History and the American Revolution" lesson. 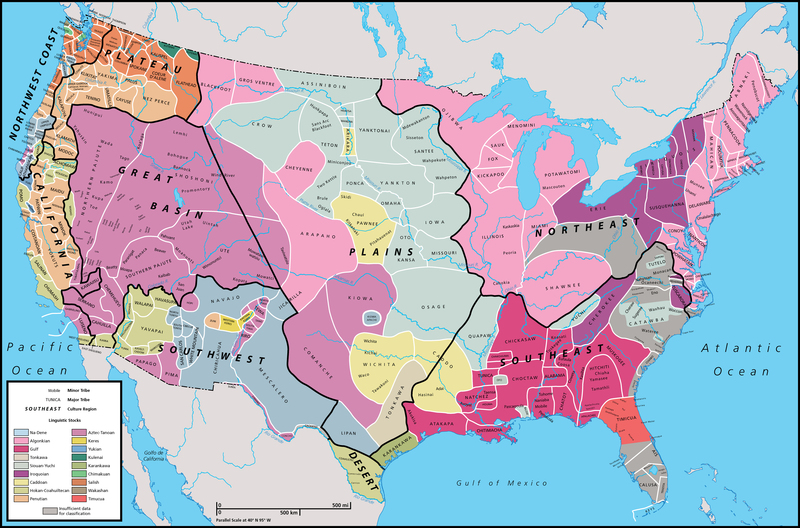 This map shows the location of native language groups before the mid-eighteenth century, but is not a snapshot of where groups were located in a specific year or time period. Breen, T.H. American Insurgents American Patriots: The Revolution of the People. New York: Hill and Wang, 2010. Cogliano, Francis D. Revolutionary America: 1763-1815. New York: Routledge, 2000. Ferling, John. Independence: The Struggle to Set America Free. New York: Bloomsbury Press, 2011. Gilbert, Alan. Black Patriots and Loyalists: Fighting for Emancipation in the War of Independence. Chicago: The University of Chicago Press, 2012. Horne, Gerald. The Counter-Revolution of 1776: Slave Resistance and the Origins of the United States of America. New York: New York University Press, 2014. Raphael, Ray. Founding Myths: Stories that Hide Our Patriotic Past. New York: The New Press, 2014. Schama, Simon. Rough Crossing: Britain, the Slaves, and the American Revolution. New York: Harper Collins, 2006. Wood, Gordon S. The Creation of the American Republic, 1776-1787. New York: W.W. Norton and Company, 1969. Wood, Gordon S. The Radicalism of the American Revolution. New York: Random House, 1993. Young, Alfred F., Ray Raphael, and Gary Nash, eds. Revolutionary Founders: Rebels, Radicals, and Reformers in the Making of the Nation. New York: Alfred A. Knopf, 2011. The Avalon Project at Yale Law School offers a selection of primary source documents from 1764-1783 related to the American Revolution. Library of Congress image of the Catawba map used in the "Interpreting a Native Map" lesson. Interactive presentations from the Library of Congress exhibition explore life before colonization in the lands that were to become known as the Americas, as well as the moment and consequences of colonial encounters. This museum will open in Philadelphia in 2017. Many items from its collection can be viewed online, including images of currency issued by the Continental Congress and the first newspaper printing of the Declaration of Independence. The interactive Trans-Atlantic Slave Trade Database contains more than 34,000 individual slaving expeditions between 1514 and 1866. Timelines, resources, narratives, and lesson plans associated with the PBS television series. In this lesson students trace the route of a Newport slave ship and examine connections the slave trade created between the North and the South. In this lesson students learn about the design elements of a map and assess the value and limitations of using maps as sources.